Paddy Kelly Cup Sunday 2nd Oct, 11am to 5pm on Lough Arrow. Please contact Jane on 086 8301261 if you require further details. Thanks to Google Maps for above image. 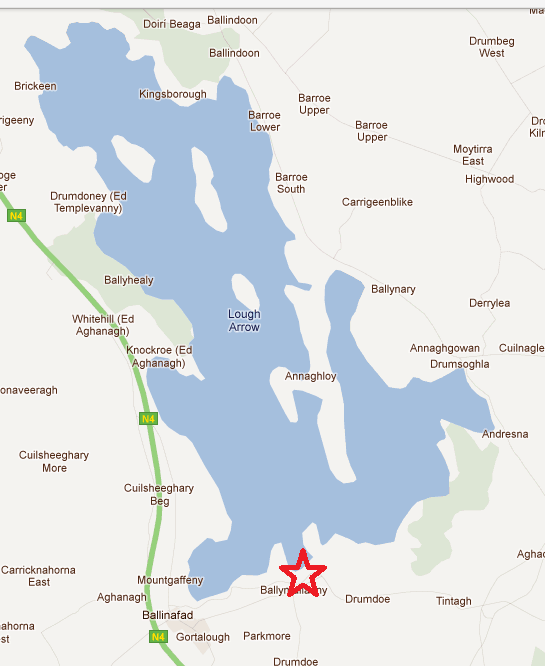 Paddy Kelly Cup now on Sunday 2nd Oct, 11am to 5pm on Lough Gara. Glancy Cup Sat 15th Oct on Oakport 11am to 5pm. Conroy Cup Sunday 23rd Oct on Lough Skean, fishing 11am to 4.30pm. Due to the forecast bad weather for Sunday 11th September the safety offices of Boyle & District Angling Club have postponed the Paddy Kelly Cup. The Club have a scheduled meeting next Friday 16th September & will reschedule the fixture then. Sorry for any inconvenience caused.